My traveling baby gets a lot of unwanted attention sometimes. The scenario is familiar. My wife and I are out exploring with our baby in a stroller or infant carrier, when a stranger’s eyes widen as they near us, gripped by passion. They make a blitz toward our offspring, hands stretched out, and they begin to stroke our child like he’s a golden retriever. Maybe it’s flattering, but as their hand strokes become more vigorous, a reaction somewhere along the revulsion-anger continuum wells up in our souls. Some parents are sympathetic to the effusive baby-grabbers, while others (like my wife and me) doggedly prefer the hands-off approach. The latter group can find themselves in a tough position, simultaneously having to justify their choice while putting it into action. Particularly when traveling to countries where babies are revered and it is customary for strangers to touch these specimens of cuteness, it can be difficult to fend off the well-intended but overwhelming affections of unknown persons. No matter where you are, at your local grocery story or on a stretch of beach in an exotic land, there is bound to be the occasional stranger interested in grabbing, cuddling and otherwise touching your baby. Can you ward off this unwanted affection? To some degree, we’re all bound by the constraints of societal norms—we want to be cordial if possible, but we also want our children to be insulated from potentially frightening and germ-ridden touch. Here are four methods for protecting your traveling baby from touchy strangers. 1. Blame it on the baby. 2. Redirect attention away from the traveling baby. By stating that your child is in less than optimal condition, you place the onus of fault onto your youth, who is not yet able to call you out on any untruth. Employ fear, gambling on the wager that the touching party is wary of germs and disease. In most situations, explanations of mild malaise suffice as an escape route for your traveling baby. The advantage with this approach is that you absolve the offending party of all wrongdoing. Your baby has been sick, plagued with diarrhea, or has been acting strange for unclear reasons. There’s no reason to steer clear of psychological problems either; you could tell people your baby is overwhelmed, which might even be true. By the nature of their curiosity and adorableness, young children can have a magnetic draw. Being the recipient of a focused beam of energy can be awkward, but deflection is possible. 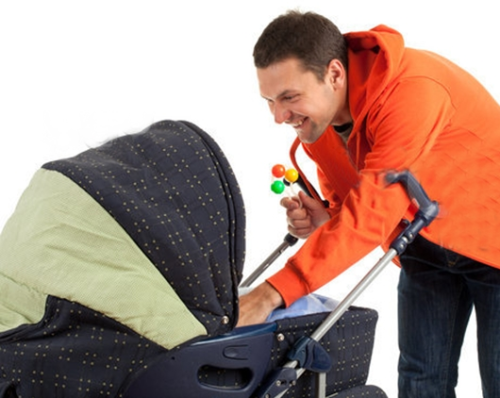 In busy locations where your traveling baby is most likely to receive physical nurturing from strangers, chances are high that events worthy of attention are unfolding, like a parade at an amusement park, or interesting tchotchkes being peddled at a festival. Using a variation on the “made you look” joke, as soon as the stranger bends down for a petting session, point out a proximal happening by saying something like, “Wow! Did you see that crazy bird over there?” It’s not unusual for the person to stand up and drop their grip on your youth. As they turn to look, veer the stroller in another direction and walk away. If using an infant carrier, you’ll be able to generate more speed while making the getaway. There are exceptions, but usually a hands-on individual will supplement their touch with a time-honored medium of communication: words. While the touch makes it implicit, they often proclaim “Oh, he’s so cute,” or “What tiny, little hands!” They’re often statements rather than questions, but even statements can be answered. If someone claims your traveling baby is charming, respond with “yes he is,” smile, and continue on your way without a moment’s pause to invite approach. You’ve been perfectly agreeable, stayed focused on the topic, and ignored any negative undertones. In severe cases, all words and courteous actions will fail, leaving parents with no option but to physically intervene. Should an individual refuse to cease their petting, insert yourself between the stranger and your traveling baby or gently push the grabber’s hands away. Of course, if you feel your baby is threatened in any way, protect your child and get out of there as fast as you can! How do you handle it when strangers try to touch your traveling baby? Do you like the attention or feel a need to protect your child? Let us know your thoughts in the comments below! My kids were patted, carried around and fussed over quite a bit when they were little and it never bothered me. I always figured if it made someone happy to hold my baby for a couple of minutes then that was fine by me and the girls always lapped up the attention. I can certainly see how other parents would be bothered by the touching though. Strangers touching your baby or grandchild? In my opinion it’s wrong on every level. “Hands off” is the best policy. Lisa, your perspective seems a healthy one. A lot of parents use different approaches in accordance with the situation. Helen, there are indeed a lot of levels to this issue. In these situations, I use what I like to call “the mirror technique.” Whatever the stranger looks like he’s about to do, I make a move to do to him/her. For example, if a person reaches out to touch my daughter’s face, I reach out to touch his/her face. It creeps people out but if my globe-trotting daughter avoids unneccesary germs from foreign countries because of it, it’s 100% worth it! Mandi – OMG, that’s hillarious! What a great tip for keeping strangers’ hands at bay! A novel solution, Mandi. I reckon it’d be quite effective, somewhat like an improvised mime.